It’s been the looming question all season long in Class 4A, Division I. 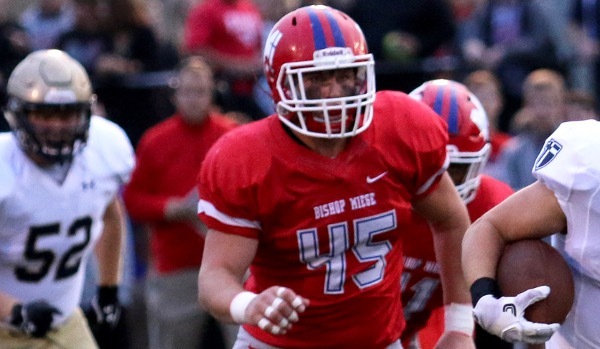 Can anyone challenge Bishop Miege and derail the Stags’ run to a third straight state title? The best opportunity for that to happen may come on Friday night. The second-ranked Basehor-Linwood Bobcats will travel to top-ranked Miege with the winner advancing to the 4A-I title game in Topeka. Miege has won the last two 4A-I titles by defeating Topeka Hayden 42-35 in 2014, and Andover Central 68-12 last season. Only a pair of 7-point, regular-season losses to Blue Valley separates the Stags from currently being on a 37-game win streak. This season, the Stags have won 10 straight games after the season-opening loss to the Tigers. The schedule has been brutal as three Miege opponents, all Eastern Kansas League foes, are playing in the state semifinal round this week. The Stags are led on offense by junior quarterback Carter Putz and a pair of talented receivers. Putz has complete 73 percent of his passes for 2,747 yards and 42 touchdowns with only two interceptions. Putz’s primary receiving targets are Missouri-commit Jafar Armstrong and classmate Landry Weber. Armstrong has 44 receptions for a team-high 1,017 yards and 17 touchdowns. Weber’s numbers are nearly identical as he has hauled in a team-high 49 receptions for 1,015 yards and also has 17 touchdown catches. Joseph Gleason has added 20 catches for 310 yards and six scores. The Stags’ backfield is young and talented. Freshman Brison Cobbins leads Miege with 718 rush yards and eight touchdowns on only 66 carries. Cobbins is averaging nearly 11 yards per carry. Sophomore Ta’Von Tusa has added 315 yards and four scores, while junior Cameron Clark has 278 yards and five touchdowns. The young group of running backs get to follow an experienced offensive line led by one of the state’s best in senior C.J. Grunhard. On defense, Miege allows only 11 points per game, and that number improves to only five points per game against 4A schools. Junior linebacker Joe Watskey leads the Stags with 87 tackles, including 13 tackles for loss and four sacks. Weber and junior Cameron Key lead the secondary with three interceptions each, while Iowa-commit Djimon Colbert has two picks and nine pass deflections. That secondary may be tested by a talented Basehor-Linwood offense. The Bobcats average 46 points per game while giving up only 12 per contest. Senior quarterback Justin Phillips directs the offense and has thrown for 1,791 yards and 18 touchdowns while completing 65 percent of his passes. Phillips also has rushed for more than 300 yards and eight touchdowns. The bulk of the carries on offense go to senior Chas Rollo. Rollo has rushed for 1,436 yards and 20 touchdowns this season. Like Miege, Basehor-Linwood has a good group of receiving threats. Eric Scott and Jackson Brimblecom lead the Bobcats with 37 and 34 catches, respectively. Brimblecom has a team-high 489 receiving yards and six touchdowns, while Scott has 480 yards and four scores. Junior J.C. Watson has 20 catches for 288 yards and three scores. On the defensive side of the ball the Bobcats are led by junior T.J. Williams. Williams has registered a team-high 79 stops with 16 for loss. Sophomore Nolan Ford has 59 tackles including 18 tackles for loss and seven sacks. Scott, who was recently offered by North Dakota State, is also a standout player in the secondary where he has 38 tackles and three interceptions. Phillips leads the Bobcats with four picks. The Bobcats are going to have to likely win the turnover battle to pull off the upset, but in the end even that may not be enough. In its short history, Maize South has reached the sub-state game for the first time in school annals after reaching the quarterfinals each of the past two seasons. Buhler has made the quarterfinals every year since 2008 and won the 4A title in 2013. This is a Week 4 rematch when Buhler defeated Maize South, 21-14, at home. Maize South, down from 5A, has outscored opponents 444-157, while Buhler is at 388-214. In the last four seasons, the Crusaders are 9-0 in the playoffs when they don’t play Topeka Hayden and 1-2 when they do. Last week, Buhler held Mulvane’s potent offense in check en route to a 24-14 home win. Mulvane averaged 45 points a game entering the contest. Braden Rose finished with two sacks, and Dalton Brown finished with 282 rushing yards. He had 198 rushing yards and three touchdowns in the first playoff win versus Abilene. Maize South, helped by a key fake punt, scored 21 straight points and defeated McPherson, 35-27, on the road. It marked Maize South’s second win versus the Bullpups; the Mavericks also captured a 14-6 victory in Week 2. Maize South picked off McPherson quarterback Casen Hoover three times and doubled his season interception total. Max Domnick had a 42-yard pick-six, and Andrew Bliss rushed 36 yards for another score. Quarterback Ethan Richardson has done well guiding the Mavericks’ offense throughout the year. He passed for 120 yards and rushed for a pair of scores. Richardson collected 116 rushing yards in the first-round 63-14 playoff win versus Ulysses. Buhler, always known for churning out great running backs, has another one in Brown. The Crusaders’ pass defense has improved throughout the season, and Buhler has enjoyed great playoff success when it doesn’t play Hayden.